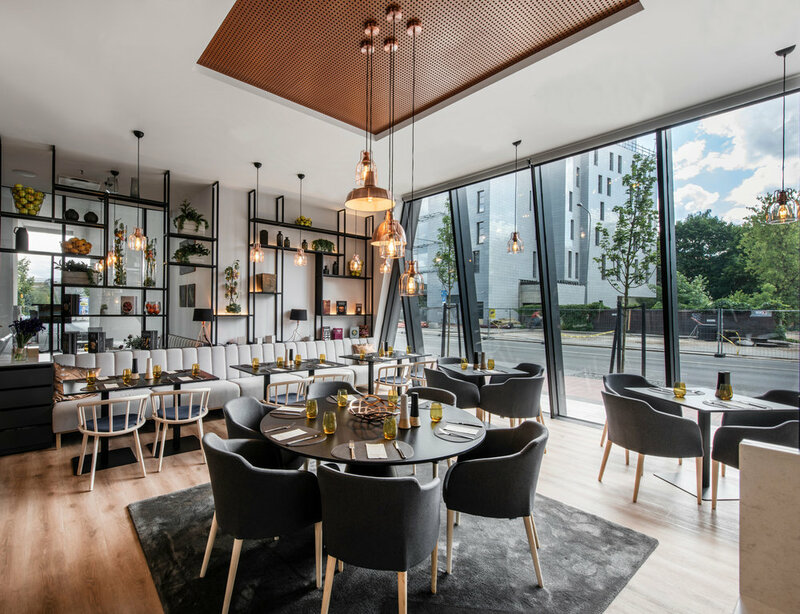 In December 2016 Atellior was commissioned by Hanner, the leading Lithuanian real estate developer, to provide the interior design services on their first Courtyard by Marriott in Lithuania. The hotel opened to the public in April 2018 as a part of a major city centre redevelopment and is located on the site of the former Žalgiris Stadium. The 199-room hotel features a contemporary a la carte restaurant and relaxing bar with a beautiful terrace facing the citadel and six stunning meeting rooms. Atellior team, headed by architects Una Barac and Ante Marić and project architect Lana Petrak, had a task to deliver modern interior design in line with the contemporary hotel architecture by encapsulating the standards of the Courtyard by Marriott brand. The new build hotel in the redevelopment area of Vilnius has enabled us to capture the beauty of the old town through the use of evocative materials, colour and form. The hotel’s distinctive exterior with sharp sloping lines and black glass façades face the old town and is a stunning statement to the old and the new. We designed a totally free-flowing flexible lobby area which is both relaxing and business like. The interior of the hotel public space reflects the building’s exterior architecture by mirroring the exterior façade lines which we picked up on in interior elements. The use of materials such as geometric brushed steel and concrete, along with the bespoke lighting complement the accent colours of bright yellow and sophisticated blue shades that we have used in the lobby and lounge interiors. The lighting design was key to the beautiful space and we worked closely with leading Lithuanian lighting designer Marius Mateika on the project. Together with Marius we designed a striking lighting feature that represent himmeli, a traditional Baltic holiday decoration made of straw. The lighting installation floats above the two-floor gallery lobby. In the restaurant, we centered the fireplace in the heart of the space and incorporated copper shades throughout to add warmth, making this the perfect place to meet and relax. The bedrooms offer a light space for guests to relax or work with tonal hues that complement aqua blue art and cool tones within wooden headboards.